30 hours FREE ONLINE TUITION through British Council's Road to IELTS preparation programme. Testing is also available in Hamilton (delivered in conjunction with Wintec, Hamilton). Work or undertake work-related training in an English-speaking country emigrate to an English-speaking country. Candidates may cancel or postpone their IELTS test by notifying the test centre more than five weeks before the selected test date. There is an administration fee for postponement or cancellation of NZ$75.00. Exceptional circumstances for postponement or cancellation may be considered by the IELTS Administration, on application. Please contact the Administrator on +64 9 968 8617 or via email ieltsnz029@manukau.ac.nz for further advice. Free of charge, if requested within 6 weeks from the test date. Please complete the form, sign and email the form to ieltsnz029@manukau.ac.nz with a copy of your passport. 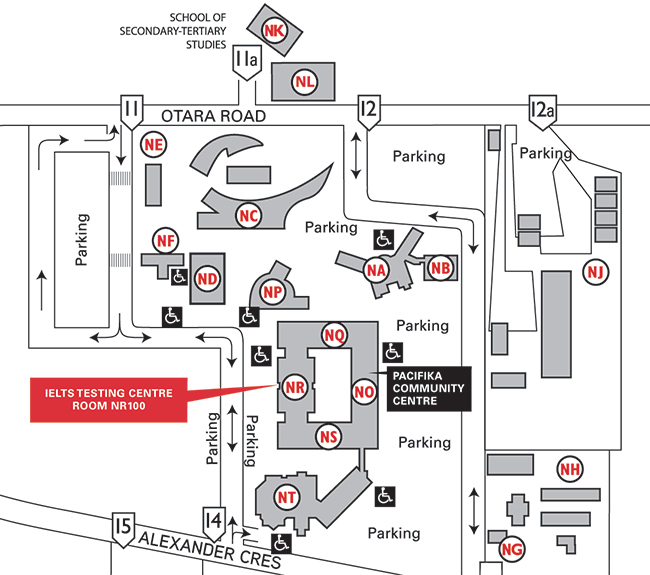 Unless stated, tests are held at the MIT Otara, MIT Commerce Street and MIT Manukau Testing Centres for all test dates. Speaking Tests are held on the same day, either morning or late afternoon. Results are released on the Friday, 13 days after the test. You can collect your results from the IELTS Centre in NR100, Gate 14, Alexander Crescent, Otara between 8.30 a.m. and 4 p.m. on results release day. After that time they will be posted to the address given on your application. Results are released on the Friday 13 days after the test. You can collect your results from the IELTS Centre in NR100, Gate 14, Alexander Crescent, Otara between 8.30 a.m. and 4 p.m. on results release day. After that time they will be posted to the address given on your application. During registration, your passport will be checked, and you will be finger-scanned and photographed. A certified copy of passport is not acceptable. No other form of identification can be accepted. Pencils, erasers etc are provided by the test centre for you to use. Speaking (15 minutes) You will be allocated a time between 9.00am – 12noon OR 4:30 – 6:00 PM on the Saturday*. You must report for registration 45 minutes before your speaking time. Please report for afternoon testing at 12.10pm. Testing should be finalised by 4.30pm. Please note: there are no breaks between the Listening, Reading and Writing tests. *You will be emailed a speaking test time by 5pm on the Thursday before your test. If you do not receive an email on Thursday, please call us on (09) 968 8617 before 10:00 am on the Friday. We are the only British Council IELTS Test Centre in South Auckland. Can I apply for my friend if I have his/her passport? Yes. Please contact the IELTS administrator on +64 9 968 8617 or via email ieltsnz029@manukau.ac.nz for further advice. What should I do if my passport is with the New Zealand Immigration Service for a new visa? You must retrieve it by showing your IELTS test receipt and letter of confirmation to the New Zealand Immigration Service and send it back to them after the test is finished. You will not be able to take the test if you do not have your original passport on the test day. If you do not have your passport, do NOT apply for the IELTS test until you can have your document with you for test day. Please Note: a certified copy of passport and driver's license are not accepted. Is there any deadline for application? The IELTS Application Form and the test fee should be received by the IELTS Test Centre at least '10 business days' prior to the test date of your choice. However, registration is on a first-come, first-serve basis and does not guarantee a first choice test date. When do I get my candidate number? You will receive this on the Thursday before the test when you are emailed your speaking test time. No, you must do all four parts if you have to repeat the test. This is the same at all Test Centres. You must report 45 minutes before your speaking test time. What else should I bring to the test? Bring your passport and confirmation letter. All bags must be left outside the examination room in a locked room. No personal belongings are allowed into the examination room. Can I bring anyone with me to the test? No. Family, friends and agents are not permitted in the test room during the IELTS test. Does the Test Centre provide headsets for Listening, for all candidates? No, we do not. We test large numbers of candidates, so headphones would not be practical. However, we have modern sound equipment in every room and the quality of the sound for the listening test is excellent. Is there any difference in the test from one IELTS centre to another? No. Every IELTS centre in New Zealand uses the same test on the same test day. There is no difference in how the examiners evaluate and mark tests from one centre to another. Why take IELTS at MIT? MIT students have access to a large section of IELTS resources in the MIT library. MIT also has a list of recommended experienced private tutors (please contact the IELTS Test Centre). Location: NR100, Gate 14, MIT North Campus, Alexander Crescent, Otara, Auckland 2023 View map.